While many other states are still grappling with giving their bumpy roads a smooth finish and their hiccuppy travel infrastructure a healthy push, Gujarat has gone ahead and written a success story on its roads, railway tracks and waterbodies. A look at why this issue has so much of Gujarat on its pages. Till about a decade ago, Gujarat?s roads were tricky and uneven, its transport service in need of overhauling, its commuting experience poor and the state of its transport infrastructure, weak. And then, things turned. As if someone had used a magic wand. The roads began getting smoother, the services began getting better, the commuters began enjoying the travel experience and the infrastructure stopped making creaking noises. The senior Central Government officers began travelling to Gujarat to know more about the reasons for its newfound transport prosperity, corporate houses wanted to have tie-ups in the state, and foreign companies wanted to launch their offices there. Gujarat?s senior officials were being invited on central government?s mobility panels and many are still on many an advisory panel. What exactly happened? How had Gujarat attained a kayakalpa? Today, Gujarat?s roads are modern and its Expressway is among the best in the country. The state is India?s only successful BRTS story ? and a first one at that: Ahmedabad BRTS, planned for 88.8km, is operational on eight routes on a network of 62km with 97 bus stations. It is a remarkable feat that has brought many laurels and awards Ahmedabad?s way. A 100km corridor has been planned for Surat, the city bubbling with economic activity, which will be developed in three phases. Phase 1 has been developed under JnNURM and its trial runs will begin in the next three months. 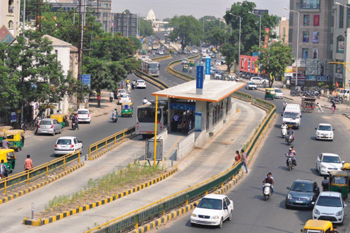 Gujarat is also busy replicating the BRTS model in Vadodara and Rajkot. It is also busy giving shape to Metro Rail between Ahmedabad and Gandhinagar and to waterway travel infrastructure. For all this, it has formed Multimodal Affordable Transport Authority (MATA) last year. MATA is entrusted with the task of ensuring cohesion and integration of all modes of transport on land, water and air. It is also responsible for the safe functioning of all these modes. MATA is also busy ensuring a speedy waterway travel and realising faster travel on Delhi-Mumbai Industrial Corridor (DMIC) and the Dedicated Freight Corridor (DFC). Transport infrastructure and traffic management in Gujarat have had serious thought going into them. The authorities are serious about not only knowing about the latest infrastructure and the best practices in the world but also applying them in the state. Jamshyd Godrej, Chairman WRI India and Godrej & Boyce Ltd, told TrafficInfraTech in an interview published in this issue on the successful implementation of Janmarg, Ahmedabad?s BRTS, ?I think it all started with the Chief Minister who realised when he saw Embarq?s presentation on BRTS that this was something that would be very useful for Ahmedabad. So you had a system where people were interested right from the top and the same feeling percolated down the line. Since people in charge were doing a good job, it was a pleasure to work with them. They were interested in making things happen and we were interested in making things happen. Even the management of local university there, CEPT, was very keen on making things happen.? Multimodal infrastructure is being followed in Gujarat in a meticulous manner. The talk of transport circles are the two High Speed Rail Corridors in association with the Ministry of Railways ? connecting Ahmedabad, Mumbai & Pune, and Ahmedabad & Dholera respectively. What has put Gujarat in high league is that these corridors will be integrated with the Metro Rail and the regional rail networks. What is also worth noting here is that High Speed Rails exist in very few countries. Modi had once famously said, ?Building Railways is in the DNA of the people of Gujarat?. Ring Roads in many big cities including Ahmedabad and Surat are projects that have totally transformed the way people commute in Gujarat. Be it infrastructure, technology or knowledge exchange, if it pushes Gujarat on the path of development, Gujarat finds a way to adopt them all. The clear backing from Chief Minister Narendra Modi to greenlight the projects that would develop Gujarat and help its people, is a noteworthy aspect here. Huge budgets are being allocated straight from the CM?s office. Commuting by waterways is an aspect that is diligently being explored by the state. A Ferry Boat Service is being given shape to operate from Ghogha village till Bharuch. A huge city, claimed to be bigger than Delhi, is coming up in Dholera. It is being promised as a model city with everything, including transport and traffic management, being worked out to the best possible limit. Newer roads are being built for encouraging cycling too. Gujarat?s Swarnim Yojana that was begun on Gujarat?s completion of 50 years with the CM sanctioning a whopping `7000 crore for urban development too has borne fruit. But obviously, there are problems ? problems that need to be overcome, problems that the administration is finding ways to arrest. In a chat, I P Gautam, Former Principal Secretary, Urban Development, Government of Gujarat told Mangala Chandran, Editor-in-Chief, TrafficInfraTech, ?The system of maintaining the health of the vehicles is something that is totally ignored in the country. People keep old cars with themselves as they are emotionally attached to them. This creates problems as the vehicles are not maintained properly and ply on the roads without proper checks being carried out. The health of the roads should also be taken into consideration. Traffic regulation, proper implementation of rules and civic sense among people is of utmost importance as by and large, the city traffic problem stems from the ignorance of people?. Gautam is of the opinion that since the state is responsible to ensure traffic and road safety, senior officers of the various departments associated with various aspects of traffic, must be aware of the demographics of the city, and the state, and must have good communication channels among them. These include the Road & Building Department, Public Works Department, Traffic Department, RTO, Municipal Corporation, etc. The articles in the following pages written by experts give a glimpse into the big picture and include Gujarat?s roads and the upcoming Vadodara BRTS.